If you are a member of a subscribing institution, then by clicking on this Springerlink pointer, you should be able to download the free e-book PDF, with the help of a blue ``Download Book' button. See the image below for an example of what the blue `Download Book' button looks like. Springer uses your computer's IP address to regulate access. 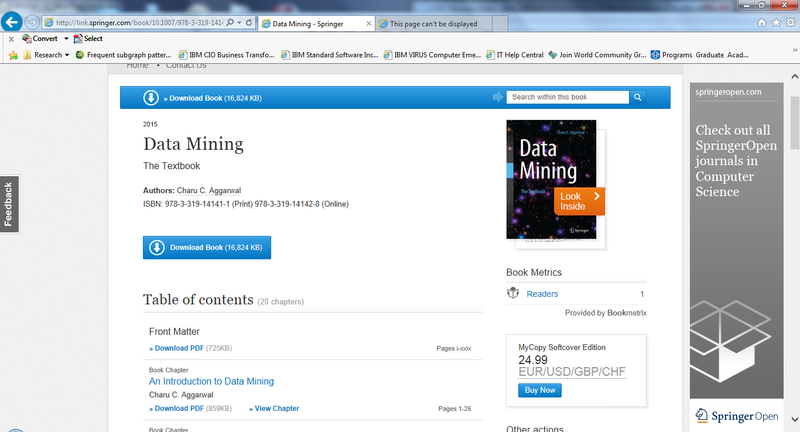 If the Springer Web server does not recognize your computer's IP address as that of a subscribing institution, then the blue `Download Book' button will be replaced with a paid `Get Access' button. Note the MyCopy option in the lower right corner of the browser for buying a low-cost paperback edition. By selecting the MyCopy option above, you can also obtain the low-cost ($25) paperback edition. The MyCopy version can only be obtained from the Springerlink site by members of specific institutions, whereas the official hard-cover can be obtained by anyone from all channels such as Springer, Amazon, or Barnes and Noble. The number of subscribing institutions seems to be surprisingly large. As far as I know, the majority of universities (and some corporations) in US, Canada, Europe, Australia, New Zealand are subscribers. The basic idea here is that your institution has already pre-paid Springer with a subscription for accessing the copyrighted content in e-book form. The additional MyCopy price is mostly to cover printing, shipping, and handling the hard-copy. If you are not a member of a subscribing institution, there are other ways of obtaining discounts by buying the official hardcover or electronic editions directly from Springer. If you are an author of any Springer book or a journal article, then you can obtain a 33% discount on Springer hardcover and e-books by using the approach described here to obtain a token number. Note that Springer journal articles (e.g., DMKD, KAIS) are sufficient to obtain the token. This token is entered under the group memberships tab in your MySpringer registration . This process then perpetually entitles you to the author discount by buying Springer books through your MySpringer registration .